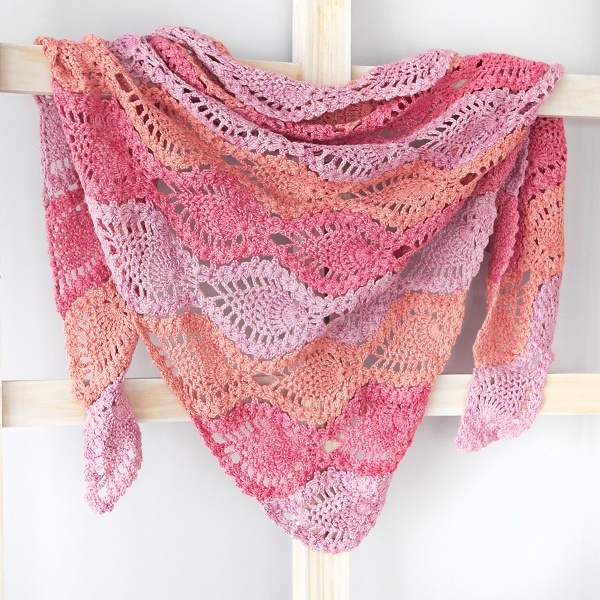 This shawl was designed by Yuli Nilssen. It is really beautiful, yes??!! Her blog page is called Nurturing Fibres. This is also the link to her free pattern. I have a few things to finish up first, but this looks like a wonder Spring Shawl I would actually wear! You??? Check it out! I sent The Crochet Dude, Drew Embrosky, an idea on how to improve those lovely plastic stitch markers that look like little locks. I'm think of a way to keep from losing your hook!! Hopefully, he will read it and actually have it made. Otherwise, another suggestion down the tubes. I don't have good luck with my designs or my new ideas. They seem to be taken and then used by the "takers" as their own. For some reason I am thinking he will not do that. I don't want to patent anything again, and I'm not into manufacturing, but he has already improved on that. He would be able to do it easily. My only desire is credit, and perhaps a few hundred stitch markers! LOL! I have two rows joined. As soon as I have the other three (four?) joined, I will post a photo. The colors remind me of the plaid afghan I made for my younger brother. Will show you why later. I may need some ideas on the rest of the bordering process. I will post photos and see what you think!